Different levels of care are chosen when you are hospitalized. Have you ever wondered how your doctor determines the levels of care that you need; whether you should be treated at the hospital or home or how long you should stay in the hospital? In most cases, it is the "severity of illness" that determines the "intensity of care" or "level of care". What you may think is simple heart burn that can be treated in the home, may really be a heart attack. The severity of a heart attack increases the intensity of the service from a simple visit to your doctor to an ambulance trip to the emergency department. There are many levels of care. Each level provides a different intensity of service. The more life threatening or unstable your life signs are, the greater the intensity of care you will receive. Life signs (also called vital signs) include your blood pressure, your respiratory system (how well you breathe), your heart function and your brain (neurological) function and blood values (laboratory values) which may show you are fighting an infection. Let's go through the various levels of care, starting with the most intense level of care (the hospital) to the least intense level (your home and doctor's office). The "acute care hospital" is more commonly referred to as "the hospital". It is set up to provide you with emergency care for new illnesses or injuries for a short period of time. The hospital is divided into different areas depending on the intensity of care and observation you require. If you require intense monitoring of your heart, blood pressure and other life signs on a frequent basis (every 15 minutes to every hour) you will be admitted to an area of the hospital which can provide you with the one on one care of a nurse. 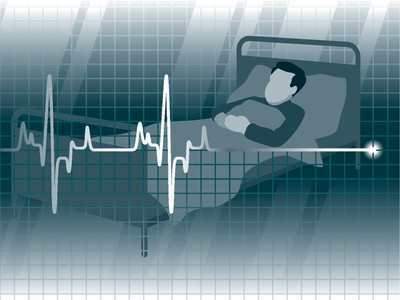 The Intensive Care Unit (ICU) or Cardiac Care Unit (CCU) of the hospital assigns each nurse one or two patients. Because of the severity of your illness, visiting privileges in the ICU or CCU are very tight. Your friends/family members will not only have to comply with the hospital's visiting hours but they will also be limited to the number of visitors and the length of each visit. Typically, you will be allowed one visitor at a time for only 15 minutes. Visitors are prohibited from bringing plants, flowers or other gifts in this area. A step down from the ICU and CCU levels of care is a unit called Definitive Observation Unit (DOU) or the Step Down Unit. Here, the nursing staff can continue to monitor your heart rate and rhythm on a heart monitor. Because your life signs are more stable they are checked every four hours instead of every 15 minutes to every hour. Nurses are typically assigned 4 to 6 patients in this area. You will be admitted to either a medical or surgical unit (med/surg) if you do not require closer observation or cardiac monitoring. While it is easy to guess the type of patients admitted to a surgical floor, understanding what is meant by "medical floor" may be a bit unclear. If you are diagnosed with an infection (such as pneumonia) or a disease (such as diabetes) which may be out of control, you are considered to have a "medical condition" and will be admitted to a medical floor. Nurses are responsible for ten or more patients on a med/surg unit. Some hospitals are large enough to have specialty areas for levels of care such as oncology (cancer), women's health and pediatric units. Whether you are admitted to ICU or any of the other areas of the hospital, the key here is you will only be in the hospital for a short time (typically less than 14 days)! What Levels of Care Come After the Hospital? What happens if you need long term care? Once again, the severity of your condition will dictate where you will receive care. Typically, once your blood values (lab work), heart rate, temperature and other life signs are stable, you are able to go home. However, there are times when your vital signs are stable but you still need Intravenous (IV) antibiotics or additional rehabilitation to increase your strength. In this case, your physician may request that a home health agency assist you with your ongoing needs. If your needs are more complex, your physician may determine that you need the extra care of a long-term acute care facility (LTAC) or Acute Rehabilitation or the less intensive care of a Skilled Nursing Facility (SNF). If you are facing a terminal diagnosis and no longer wish to receive aggressive treatments, your physician can order Hospice to assist in providing you with comfort and supportive care. Let's look at what each of these areas has to offer. We will start with the most "intense" levels of care and work our way down. Long Term Acute Care Hospital (LTACH): Long term acute care hospitals are not the same as nursing homes! Long term acute care hospitals provide intense care to patients who require at least thirty days of care. A patient who is trying to be taken off (weaned) from a breathing machine (ventilator) would be an example of one of the many types of patients receiving care from a LTACH. Acute Rehabilitation (Acute Rehab): Acute rehab facilities provide intense rehabilitation services and nursing care. To qualify for acute rehab, a patient must be able to participate in at least three hours of various forms of therapy including physical therapy, occupational and/or speech therapy. A few examples of patients who benefit from Acute Rehab include stroke patients, amputees or other trauma patients. Skilled Nursing Facility (SNF): Sometimes referred to as Sub-acute facilities, nursing homes, or convalescent homes, SNF's provide low intensity skilled care in the form of nursing services or rehabilitation to chronically ill patients. Patients who may be transferred from an Acute Hospital to a SNF include patients who require ongoing antibiotic therapy or low levels (0.5-1 hour) of rehabilitation therapy such as physical and/or occupational therapy. Home Health Care: Home health care is not the same as "home care" (shift care/attendant care). Although the terms are often interchanged, there is a significant difference in these levels of care. Home health care provides skilled care in the form of nursing services, social services, and/or rehabilitation services. Some home care agencies are also able to provide a dietician and psychiatric nursing. Visits are usually short (typically less than four hours) and intermittent (they may occur daily but typically visits are scheduled only a few times a week). Physical therapists cannot only provide exercises to help improve your strength, they can also evaluate your home to determine if you would benefit from certain forms of safety equipment. Social Workers are able to assist you with long-term planning needs which could include providing you community resources such as support groups, Meals-On-Wheels, or transportation services. Attendent Care/Home Care (also referred to as domicile care in the U.K.) refers to care provided in daily shifts of eight hours or more. The care provided does not always require the skills of a licensed person. For example an individual with Parkinson's may require assistance with what is considered activities of daily living (ADL) which include bathing, dressing, and meal preparation. Performing these activities does not require the skills of a licensed individual. In cases such as this, the care is usually not covered by medical insurance. Hospice: Hospice was created to provide support to families and individuals facing the final phase a terminal illness . The care provided promotes comfort and dignity. Individuals under hospice care have elected to forgo additional "aggressive" treatment including medications which are meant to prolong life. As you can see that there are quite a few levels of care. Where you receive your care all depends on the severity of your illness.